These frames are perfect. I originally found them on Horchow, but I loved the free shipping on Overstock. I bought 3 sets and hung them going down the staircase. 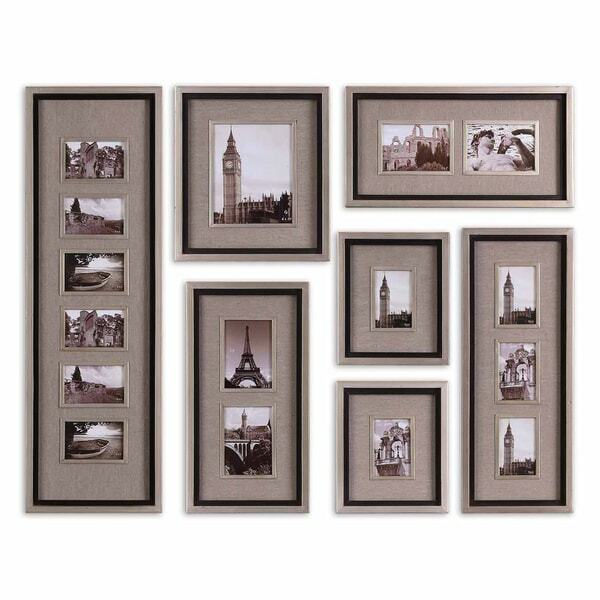 You will have fun coming up with ways to incorporate this high quality Massena photo frame collage set into your decor. This collection of frames features a lightly antiqued silver leaf finish with a matte black liner. I bought 2 sets of these because I wanted alot of the same style frames for a family photo wall project we're planning for our stairway wall. I saw these on Wa***ir originally, really loved the look, and then (as always) I found them here on O'stock for less $. Can't beat O'stock shipping charges. Honestly, maybe it was because I've never purchased this many picture frames at one time before, but I was feeling the price was a little steep, that these weren't the best value... until I opened the box and saw them in person. They are lovely, well-crafted, and for the quality and look, well worth the money. The frames have a burnished metal appearance somewhere in between silver and gold--looks perfect against the gray wall color--and the linen-y textured matting give them a real high-end, custom look. Another sign that these are quality--the included hanging template. It was a GODSEND. Made hanging 14 of these in a random, staggered pattern going up the wall a 2-person, 3-hour job instead of a 3-day job. Highly recommend this product. These frames are very classy and professional. They fit easily into a contemporary or traditional decorating scheme. They blend with both gray or tan decor. Also look well with gold or silver.